Why does Mozambique have a picture of a coelacanth on one of its coins? Like the currency of many African countries, the notes and coins of Mozambique feature images of some of the majestic animals of Africa: the elephant, the rhino, the lion. But one Mozambican coin features a rather more obscure animal, the coelacanth. 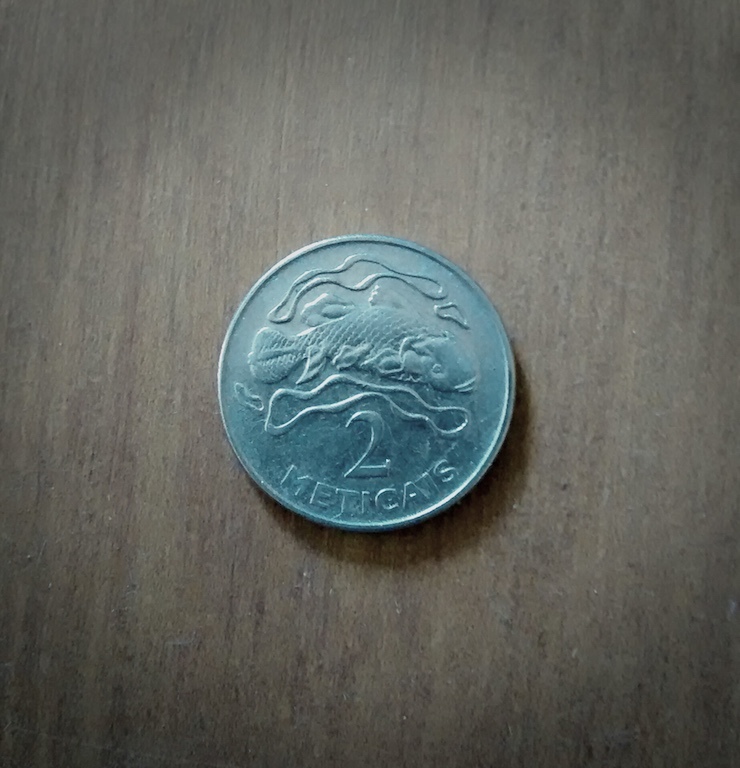 When you first look at the Mozambican 2 Meticais coin you might see what looks like a regular fish swimming in water, with the scales, the classic fish head and tail, and waves all standing out from the metal. It’s only when you look closer do you notice something a little bit odd about this fish – the fins. They don’t look quite right: they’re longer and more bulky than normal fish fins. If you let your imagination wander you could think that they like a bit like legs. If you did, you wouldn’t be far off the truth. Those fleshy protrusions are a defining feature of the group of animals known as the lobe-finned fish, or sarcopterygians. Once common in the oceans of the world, the water-dwelling sarcopterygians are now very rare – only 8 species exist. But they are still extremely important in understanding where life on land, like those elephants, rhinos and lions, came from, and the coelacanth has a very significant role to play. However, what is interesting about the coelacanth isn’t limited to that role. For 65 million years coelacanths were only known to science from the fossil record. Just like the dinosaurs, coelacanths were thought have gone extinct in the late Cretaceous period, some 65-75 million years ago. Then, in 1938, off the coast of South Africa, a single, recently-live coelacanth was trawled by a fishing boat. The discovery was a sensation (at least in the world of biology) and sparked a world-wide search for more coelacanths. Mozambique got in on the act in 1991, when the largest known coelacanth was caught off the coast near the Zambézian provincial capital Quelimane. Since then, another population was discovered in Indonesia and declared a distinct species from the African coelacanth in 1999. Because there had been such a gap in our fossil records of coelacanths, the coelacanth was quickly labelled a ‘living fossil’ – probably the most famous living fossil in the world (I use ‘living fossil’ because its common usage, especially in relation to the coelacanth, but see the end of the post for why it is such a bad term). That 65 million year game of hide and seek gives it a special status but it’s real importance to biology is of what it can tell us about the evolution the tetrapods, the group of animals that includes all four-legged animals on earth, the group that includes the elephants, rhinos and lions. The family tree of the sarcopterygians including all the tetrapods. Crosses mean that species is extinct. Coelacanths are our most distant relatives, after them our family tree includes ray-finned fish! 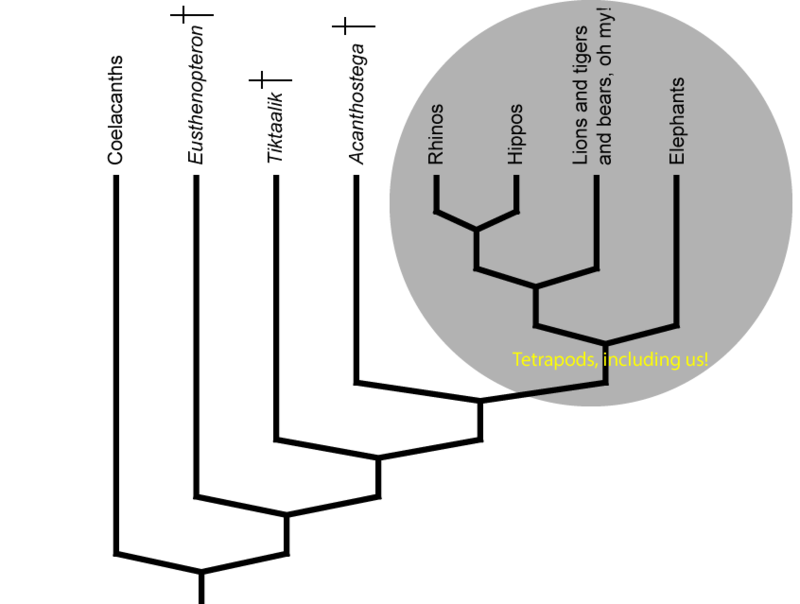 Strictly speaking, the tetrapod group belongs to the sarcopterygian group, as humans belong to the apes and apes belong to the mammals (see the family tree above). This means that the coelacanth is closely related to all living and extinct members of the tetrapods and shares a common ancestor. By studying the biology of the coelacanth, we can gain an insight into the transition from fish to land-dwelling animals. This transition began some 380 million years ago in the Devonian period. 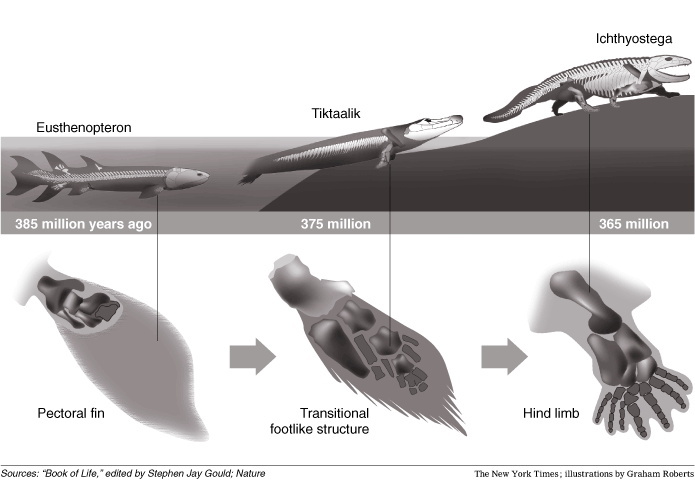 Discoveries of fossils of amphibian-like fish or fish-like amphibians such as Panderichtys, Tiktaalik, and Acanthostega have told us a lot about the features that changed as the animals colonised land, with more adaptations to breathing air and moving on land. These fossils forms part of a lineage of animals ever closer to land-dwelling creatures, and though coelacanths aren’t part of this direct lineage, the common ancestor it shares with the Devonian fossils means that the coelacanth should share many features with their land-colonising cousins. Coelacanths also have a distinct advantage over these fossils – they are alive. This means we can study their DNA and find genetic signatures of the water-to-land, fin-to-limb transition. The coelacanth genome was sequenced in 2013 and revealed a number of genetic changes related to adapting to life on land. For example, researchers found changes in regions of DNA that regulate genes (aka gene regulatory regions) that shape more tetrapod-like limbs. They also found an increased variety of chemoreceptor genes that are useful for the sense of smell and taste in land-dwelling animals. Why would the coelacanth possess features that are so related to terrestrial life? The predominate theory is that though these features originated and therefore evolved during life in the water, they have been recycled and reused in animals that live on land – a process called co-option. It’s a kind of re-shuffling of the genetic material where a trait first evolves to serve a particular function but subsequently serves another. Co-option is quite a common process in evolution – feathers started life being used by dinosaurs to attract mates or keep warm, and only later were co-opted for flight. The genetic shuffling that started in the coelacanth may have been enough for evolution to take hold, fine tuning the genes and their regulation to result in load-bearing limbs and air-borne chemical detection systems (once life on land became an appealing prospect – there’s much discussion why fish might have actually come out of the water in the first place). Without the genome information from the coelacanth we never would have known about this instance of co-option. So, the coelacanth is really rather important. It is the last living link between us and the kind of fish we eat for dinner and tells us a lot about how we ended up on land. And Mozambique can be proud that it has, within its waters, one of the biggest ever finds. p.s. Why is ‘living fossil’ not my favourite phrase? Modern coelacanths do look extremely similar to fossils coelacanths, so I can see where the idea of a ‘living fossil’ comes from. But they are not the same as those fossils. The coelacanths that have been caught off the coast of Mozambique have been evolving for 70 odd million years. They have been at a much slower rate than other sarcopterygians (possibly because they are very well adapted to their habitat already) but they have still been evolving – they are no fossil! The coelacanth is a critically endangered species, and is one of only eight living lobe-finned fish species alive today. Luckily it has no real commercial value: apart from being coveted by collectors, it is worthless as a food as the oils contained in its tissues give the fish a foul flavour. However, its survival is threatened by commercial deep-sea trawling, which also threatens many other species. Take a look at Greenpeace’s information on the damage this form of fishing does to ocean life.